“Cactus-disc”, referring to the flat-round disc-shape of some species in the genus, when they were first described. A genus of low-growing plants generally solitary, globose, more or less flattened, with numerous tuberculate ribs, with areoles covered by spines. Usually, spines are robust, often flattened at the base and curved. Apical cephalium densely woolly from which appear stiff bristles. 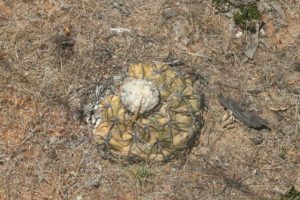 reported a case of hydrochory with Discocactus bahiensis (Taylor & Zappi 2004). red earths, or manganesiferous black soil, siliceous gravels or fine crystalline sand, yellow or white quartz (D. horstii), in pockets of humus, also alluvial areas or on slopes of rocky hills, in very open woodlands, from 100 m (D. ferricola) up to 1300 m in altitude (D. placentiformis). 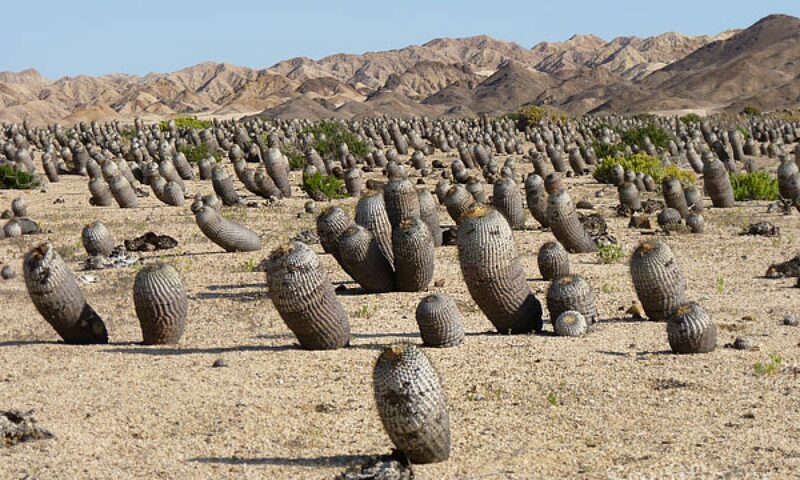 In periods of drought, some species become mimetic, often covered with soil and various organic debris which protect them from the sun and dessication. Some species such as D. silicicola, may withstand minimum temperatures of only +5°C in winter in their habitat. Bolivia (Santa Cruz), Brazil (Bahia, Ceara, Goias, Maranhao, Mato Grosso, Mato Grosso do Sul, Minas Gerais, Pernambuco, Piaui, Tocantins), Paraguay (Amambay).